I4318 1931 - 2011 (80 years) Submit Photo / Document Has 10 ancestors and 3 descendants in this family tree. 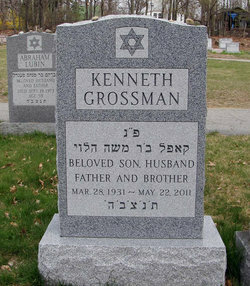 HYANNIS — Kenneth Grossman, 80, of 132 South St., Hyannis, died on Sunday, May 22, 2011, in Epoch Nursing Home in Brewster. His wife of 44 years, Jane (Coyle) Grossman, died in February. He leaves three daughters, Lisa, wife of Brian Moss of Brewster, Deborah DiLiddo of Mashpee and Tina Perry of Yarmouth; two sisters, Gladys "Goodie" Safer of Stoughton and Sylvia Burack of Worcester; six grandchildren; and five great-grandchildren. He was predeceased by a sister, Zelda Freedman. He had owned and operated Grossman Brothers Jewelers in Worcester for 35 years, which was founded by his father and uncle. He co-founded and co-owned Grossman Jewelers in Hyannis for 15 years, retiring in 1996. He was a charter member of the Holden Lions Club and had served two terms as its president and was a Zone Chairman for the Lions Club District 33A. He was a member of the Chabad Jewish Center in Hyannis. He was born in Worcester and was the son of Morris and Tillie (Rutman) Grossman and had lived in Worcester for 40 years and in Holden for 10 years before moving to Hyannis in 1981. He had served in the National Guard for 11 years in Headquarters Company, 181st Infantry in Worcester, and was discharged as its mess sergeant. Funeral services will be held at 1 p.m. today, Tuesday, May 24, in Perlman Funeral Home, 1026 Main St., Worcester. Burial will be in Worcester Hebrew Cemetery. Memorial contributions may be made to the Chabad Center, 745 West Main St., Hyannis, MA 02601.